This fall I’m teaching, among other things, Constitutional law, an area I did not study while in grad school for my Ph.D. in political science. However, it has allowed me to reconnect with some of the ideas I turned over in my head 10 years ago in law school, and I was reminded of an interesting discussion I had with several classmates while preparing for tomorrow’s class on the modern Commerce Clause. It has to do with the validity of the jurisprudential theory of original intent. Some people argue that attempting to identify the “original intent” of a document drafted and ratified by multiple authors is impossible because the different actors involved may have had different intents and it is impossible to determine a way to give priority to one of these intents over another. That’s not the argument I have in mind. The problem I want to raise is that it is quite possible that none of the drafters had a single “intent” at all. The Constitution is a political document produced through negotiation between parties with very different objectives. As anyone who has ever engaged in any negotiation knows, the parties give a little in one area to get more in another area in order to come to some final agreement. As the product of this kind of process, there is no reason to believe that the Constitution is coherent the way that we could expect of a philosophical document produced by a single mind. The horse trading that led to the simultaneous creation of the Commerce Clause, the Necessary and Proper Clause, the Supremacy Clause, and the Tenth Amendment may therefore not have produced any coherent meaning, but only a balance of different arguments that can be drawn upon by judges (and Congress) to use in their best judgment to deal with the “inevitable crises of human affairs” as Justice Marshall put it. However, if true, then originalism cannot work as a theory of Constitutional interpretation. One can’t find the original meaning of a document if there is no original meaning in it. Recognizing the political nature of the Constitution ought to lead one closer to the legal realism espoused by Dworkin, and away from the strictures original intent. The New York Times’ Economix blog had a piece today relevant to my previous post on the way that the national economy supposedly drives voting. The gist of it is that expert estimations of the state of the national economy are often inaccurate and sometimes substantially so. 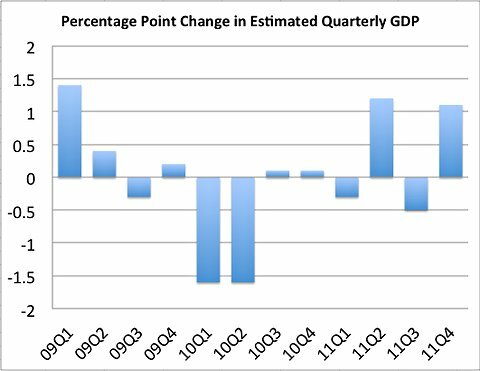 We are still revising our estimates for what the state of the economy was in 2009, and it turns out that some of our earlier estimates were off by a lot. How again are lay persons making voting decisions based on national economic conditions when even the experts do not know what those conditions are until years later? If you read political science blogs discussing the American presidential election then by now you will have seen many versions of the following post: some journalist makes a claim that something Barack Obama or Mitt Romney has said or done will influence the outcome of the election, and the political scientist responds that this is unlikely because presidential elections are decided by the economy. Campaigns, we are told, do not matter because voters essentially decide how to vote based on the state of the economy in the 3rd quarter of every election year. I do not doubt the pile of research that shows that the state of the economy is the best predictor of electoral success. However, I have a problem with the causal mechanism proposed by the stronger, almost deterministic, versions of the economic voting hypothesis. The reason is pretty simple: how do voters know the condition of the national economy? Let me elaborate on why this is a problem. We know that voters decide who to vote for based on the state of the national economy, not based on the state of voters’ local economies. But if this is true, how can they possibly make that initial appraisal into the factual state of the economy without resort to the messages found in the media, which are inevitably influenced by the framing produced by the campaigns (and their allies)? Where else could they get that info? Almost no individual voters have sufficient experience or information to make determinations regarding the health of the national economy. E.g. I have a pretty good sense of how many businesses have opened and closed in central Lincoln, but I don’t really have a sense of things in Omaha, much less how well things are going in Dallas and San Diego and Detroit, etc. Even professional economists do not know what the state of the economy is in real time. They rely on reports issued by the Department of Labor, the Fed, etc. months after those economic conditions were in existence. The only way to get information about the national economy is from reading the news media and from listening to campaign messages. The news mostly reports what the candidates and advocacy groups say. And campaigns are obviously engaged in the sort of competitive discourse that the economic voting hypothesis seeks to refute. Especially when you combine this with the fact that most of us do not evenhandedly appraise new information, but rather seek out info that confirms our pre-existing biases, it is hard to see how the material conditions of the economy could influence vote choice. What this would mean is that elections are more about discourse than about material economic conditions, but it is a discourse about the empirical state of the world. And when you think about the types of “debates” we have over the course of a campaign, you see that most of them are about what is, not what ought to be, suggesting perhaps the practitioners have already figured this out.